Just over a year ago the Park Geun-hye administration took office and, despite some political opposition, created a powerful new "super" ministry that Koreans and the media here refer to simply as the "Future Ministry," (미래부). The full English title is Ministry of Science, ICT and Future Planning, for which the acronym MSIP is frequently used. As discussed in numerous earlier posts, the Future Ministry plays a key role in implementation of the Park Geun-hye administration's signature "creative economy" initiative. With the formation of this new ministry, it assumed responsibility for all of the nation's ICT sector research and development. In that regard, I've recently been reading a Korean language report published by the ministry in February. (2014년 정보통신·방송 기술진흥 시행계획) (2014 Telecommunications and Broadcasting Technology Implementation Plan). That report contains a diagram that helps to explain how the ICT R&D system was reorganized into ten sectors within the Future Ministry, consolidating functions that had been dispersed under the previous Lee Myung-bak administration to the Korea Communications Commission, the Ministry of Culture, Sports and Tourism and the Ministry of Knowledge Economy. The English translations from the Korean are my own. (click on the diagram to see a full size version). 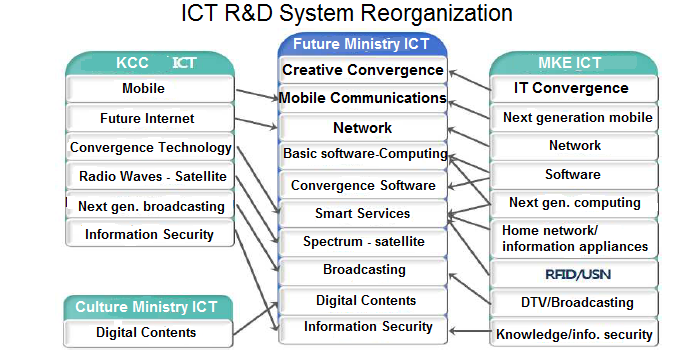 I found this diagram of particular interest because of my recent research with Professor Park Jaemin of Konkuk University that focused on government reorganizations affecting the ICT sector from 1980 to the present. Our article was finally published by Telecommunications Policy this month.